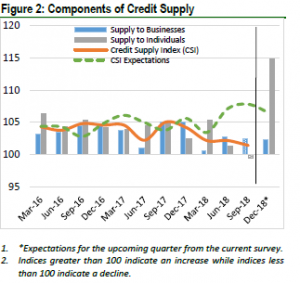 According to the Bank of Jamaica (BOJ), “Growth in credit availability, as measured by the Credit Supply Index (CSI), moderated when compared to the previous quarter.” It was further indicated that, “the CSI moderated to 101.4 from 102.2 in the previous quarter and reflected a decline in credit supply to individuals relative to the previous quarter, the effect of which was dampened by an increase in the growth in credit supply to businesses. The rise in the supply of local currency credit made available moderated slightly due to growth in credit made available by lenders to the ‘Tourism and Distribution sectors.’ Foreign currency loans indicated a slight growth in credit supply which was reflected in the Entertainment, Tourism and Distribution sectors. 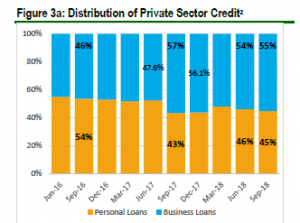 Additionally, the allocation of credit between businesses and personal loans remained grossly unchanged when compared to the previous quarter, with businesses accounting for the majority. 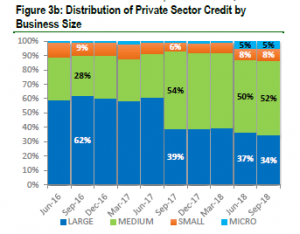 With respect to businesses credit distribution, credit to medium sized businesses continued to account for the “lion’s” share of lenders business portfolio, with the proportion being a little more than that which was obtained in the prior quarter.